Warming one pot meals are a welcome site this time of year. After shoveling multiple inches of snow in the bone-chilling cold, coming home to a hot steaming bowl of chili could not be more comforting. 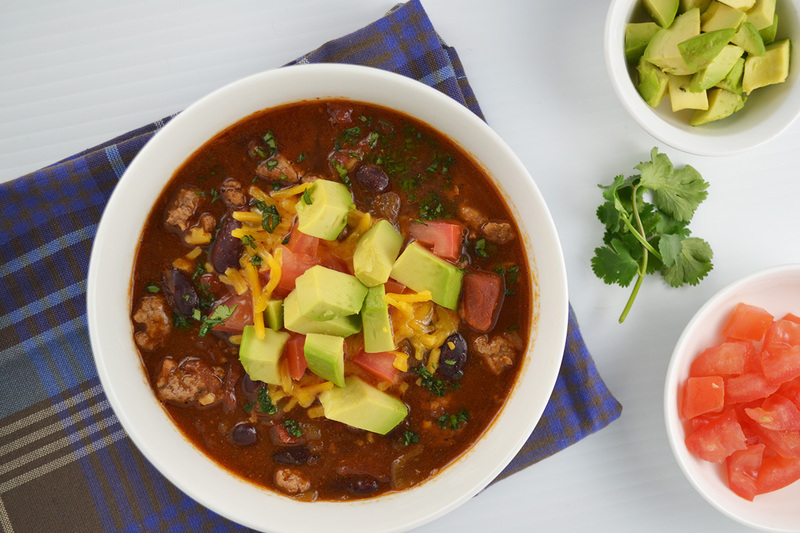 Plus this chili is healthy (bonus!). I used turkey instead of beef for this lowfat version but the spices and an uncommon special ingredient round out the flavors of this dish to make it just as tasty as the beef version. The special ingredient is chocolate. Yes, chocolate. Not the sweet kind but unsweetened and no, you won’t taste it. It simply adds a deep rich flavor to the chili. This recipe is a combination I created from recipes I’ve made in the past by both my mother and grandmother. I always liked the zing of the canned diced tomatoes and green chile in my mother’s recipe – pantry items are always a plus this time of year. While my grandmother used beef brisket instead of ground turkey in her beef chili recipe in “The Art of Good Cooking,” she also used that magical special ingredient, chocolate. Together with beans, garlic, onion, and of course, chili powder, this is one irresistible easy weeknight meal. The harshest days of winter may have come late this year but they are here now and it’s probably no surprise that I turn to classic dishes such as this to get me through the worst of it. I can eat this chili all week, it gets better as it sits. Just change up the toppings: avocado and cheese for a few days then tomato and sour cream. Top it off with a sprinkle of cilantro and the freezing snowy days seem just a little more bearable. Heat a large soup pot over medium heat. Add 2 tablespoons of olive oil and heat for 1 minute. Add ground turkey and sprinkle with ½ teaspoon salt. Brown while breaking up meat with a spatula until pink is no longer visible. Remove turkey from pan and set aside. Heat remaining 1 tablespoon olive oil and leftover turkey juices over medium heat. Add onion and garlic. Let sauté for a few minutes, until onion is translucent. Add chili and cumin. Add chocolate and allow to melt. Stir in tomato paste, diced tomatoes, green chiles. Bring to a simmer and add beans. Add broth or water and bring to a simmer. Add cooked ground turkey and bring to a boil then reduce to a simmer. Allow to simmer for 5-10 minutes. Season to taste with salt and pepper. Serve hot with choice of toppings.